Science graduate turned leading economist David Gruen laughs as he says he is vicariously indulging his passion for science through his son, who will be attending a Physics Olympiad at Monash. 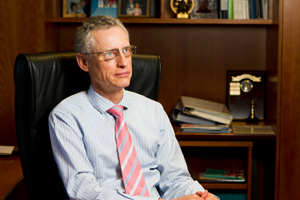 Gruen, executive director of the Australian Treasury’s macroeconomic group since 2008, is one of Australia’s most highly-regarded experts on economic trends and has been a key influence in policy decisions in the wake of the global financial crisis and commodity boom. Gruen only switched to economics at the age of 29 after completing an honours degree in theoretical physics. He says although he came to his chosen career somewhat late, studying science improved his critical thinking. With his son soon to begin tertiary study, Gruen believes that universities must generate critical thought and spark passion in their students. “Teaching people how to think is important. When we employ people [at the Treasury], I often say that we’re looking for signs of life,” he says. While he no longer uses physics or chemistry in his day-to-day work, Gruen regularly draws on his understanding of the scientific method. His father, the late Fred Gruen, was a well-known Professor in Agricultural Economics at Monash University. However, Gruen says he was never under pressure to follow in his father’s footsteps. Gruen then spent four years living on campus at Farrer Hall, where he found university life and study enjoyable. His advice is to study what you enjoy. Gruen has recently been asked to sit on an advisory board for Monash University’s physics department, and says he looks forward to the opportunity.